And here we are. The last video we have from John and Kyle. This series has been a part of my life for the past two years. Working on it has helped define my goals and prepared me for all there is to come. Also, we tell a lot of funny jokes about penises. Don’t get me wrong: this video is hilarious. But it also shows all the fun we had making the movie (and expertly excludes all the irritating, stressful times that also definitely happened). The movie shows the final product, but the blooper reel shows the experience I took away from it. Again, there are some seriously funny jokes about penises in this video. Hopefully someday there will be more to come. For now though, enjoy the movie, and enjoy this. John and Kyle signing off. We haven’t done everything yet. The general rule in filmmaking is that the script-page to film-minute ratio is generally 1:1. So here’s a pro tip: don’t write a 40 page script and try to cram it into a 30 page movie unless you are DAMN SURE that you can do it. We shot John and Kyle Do Everything: The Movie with the intention of maintaining a breakneck pace throughout, and even with completely removing some scenes and trimming everything as short as humanly possible, the film just BARELY squeezed into 30 minutes. That being said, we were left with some killer extra content in the form of a hilarious six-minute long deleted scenes video. Six minutes. That is one fifth of the movie that was left on the cutting room floor. How nuts is that? Needless to say, if you haven’t seen the movie, please DO SO before you watch this. Don’t be silly. We have one video left for you! 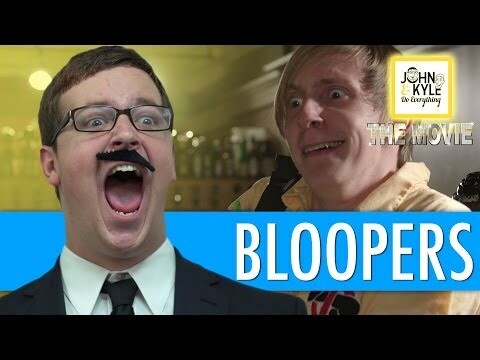 Be sure to check out the crazy bloopers reel next week!